I have a mixed bag of products again in my QPR post for May and two of them were actually bought overseas, but they can be ordered on line from Amazon. I'm happy to report that its a straight 8 with my scoring, which is a first on my QPR post. 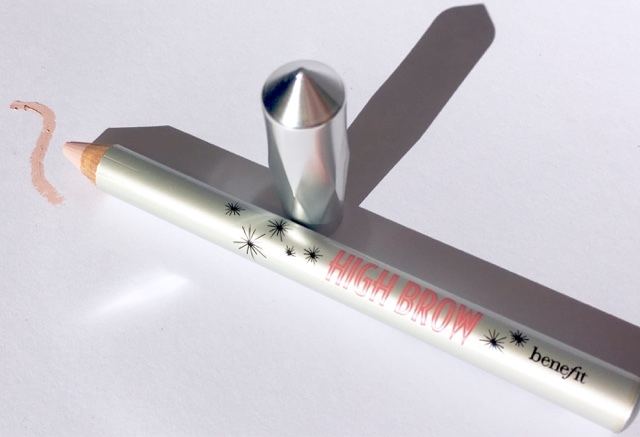 This creamy eyebrow highlighter accentuates arches for brighter, boosted and younger-looking eyes and works wonders for visibly lifting the brows. Champagne/pink coloured, so it's Ideal for all skin tones and the soft pencil glides onto brow bones and blends in like a dream. It's an absolute pleasure to use. 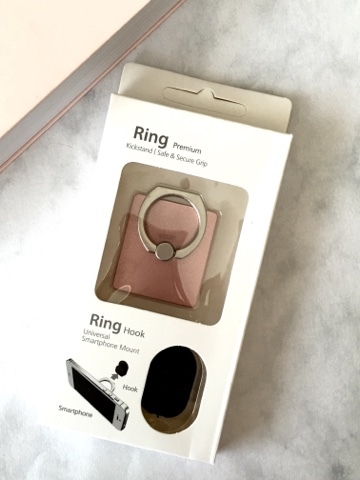 I had looked for these slimline cell phone Ring Hooks unsuccessfully for sometime in South Africa and was cross with myself that I didn't buy whilst I was last in the UK in November. I ordered via Amazon and my London "Kiddiewink" brought over for me in February. 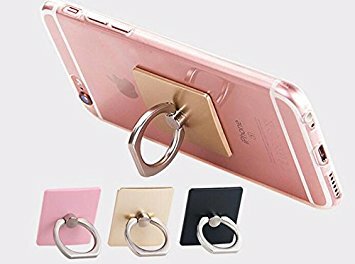 The Ring sticks onto the back of your cell phone and allows you to hook your finger through giving more security when holding your phone.You can also use as a kickstand to prop your phone up if you want to watch a youtube video or movie. Available in several colours Black,White,Silver and Pink Gold. Can be re stuck up to 100 times and sticks onto all phones. It also comes with a Universal Smartphone Mount that can be mounted on your dashboard and works with the Ring. I've been using this little gadget now for several weeks and it seems very secure and it's well worth a purchase. Niomi Smart’s passion is healthy food and her most popular YouTube video series, What I Eat in a Day, inspires a global audience of millions to look, live and feel better. 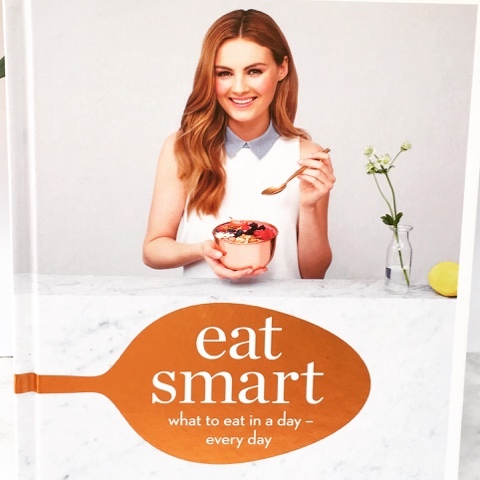 Now, for the first time, she has compiled all of her favourite recipes into a cookbook to show you the smart way to eat. Again my son brought this over from the UK for me, but you can do a special via Exclusive Books for approx R480. It's a lovely book, with easy to follow plant based recipes, but unfortunately I found several of the ingredients used are unavailable here in Durban and many that are, come at a high cost, so sadly it's more for my book display rather than being used to its fullest. Through my series of posts "Sunday Sample" I have discovered some great products that may not have been on my beauty radar and perhaps never would have been and this weeks little golden gem is one those. This ultra rich face & body gel from the French brand NUXE forms part of their Rêve de Miel® range which primarily contains ingredients like Honey and Precious Oils, ensuring that this range is a pure delight for all skin types. This golden,paraben free,soothing cleansing gel cares for dry and sensitive skin and is gentle enough to be used every day by the whole family. With its wonderful aroma of honey, this rich, lipid-enriched gel containing Honey and Sunflower cleanses the face and body whilst respecting that important hydrolipid film. Apply a small amount of Rich Cleansing Gel in the morning and evening to moist skin over your face and body, enjoy its generous foam and then rinse off. It was an absolute pleasure to use and with its pump dispenser, on the generous 400ml plastic container, makes it an ideal product for daily use in the shower. I loved the way it transformed in a creamy foam and comforted my skin rather than leaving my skin feeling tight like so many other body washes do. Thank goodness for my Sunday Sample series of posts otherwise I would have overlooked this "French Beauty". 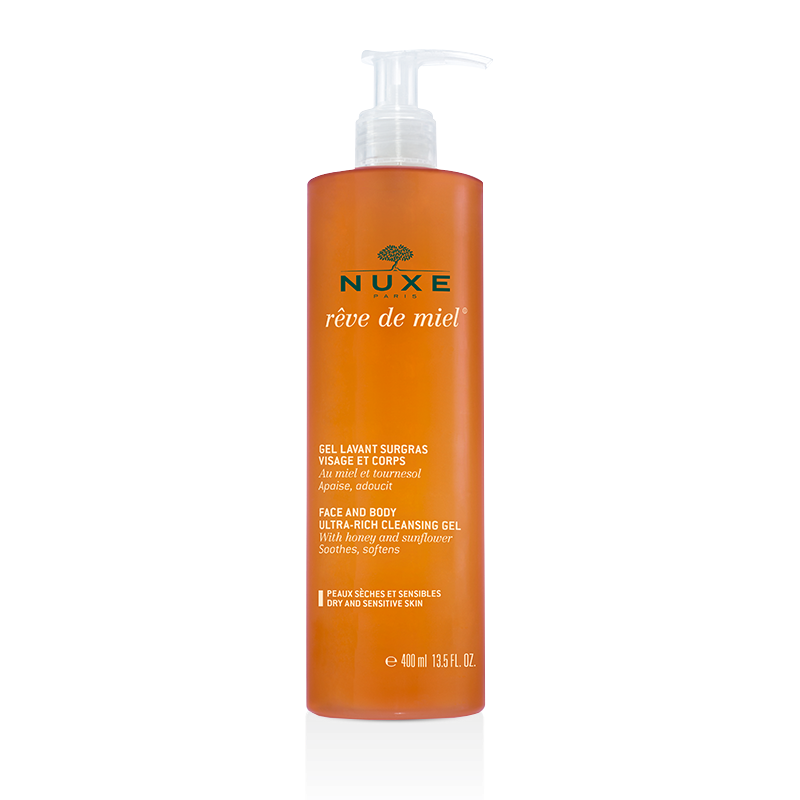 This weeks Sunday Sample was only added to my Sample Jar this past Friday and I have to say, it sounds like a very interesting product from The French brand NUXE and it's part of their rêve de miel range. I'm excited to try the Face & Body Ultra Riche Cleansing Gel,which contains Honey & Sunflower.This paraben free cleansing gel has been formulated to be gentle cleanse both the face and body. Skin Republic Foot Peel is a luxurious at-home treatment that peels your feet to remove dead skin cells and calluses.The specially designed booties contain 15 plant extracts (including ginko biloba and green tea) that soak into the skin removing calluses and dead skin cells and is also rich in vitamin E to leave your feet smooth and silky. Alpha hydroxy acids (AHAs) remove dead skin cells leaving you with soft, crack-free skin. Each foot peel mask contains 2 booties for one application and is Dermatologically tested. Having heard and read a mixed bag of reviews and knowing that "peel" booties have to be on my feet for 90-120 minutes and that my skin may peel and shed like a snake during the week post application... has put me off somewhat. Seeing that the weather has changed here in South Africa and open shoes now make way for closed I've decided to now put this Foot Peel to the test. Application is super easy, but you do need to allow the suggested time in order for the AHA's do their job. I left my booties on for 120 minutes. Also be aware that it's not easy to walk around with the booties on as your feet are squishing around in a wet, jelly type solution, so it truly is a case of "put you feet up" for the hour n a half to two hours. After washing and drying your feet, open the pouch and take out all-in-one bootie. Cut open bootie along the cutline and place feet inside bootie. Wear booties for 90-120 minutes, then remove feet from booties, wash thoroughly. After using the foot peel mask, dead skin cells will naturally peel off within a week. To be used only once every 6 weeks. For best results on extremely rough callused heels we recommend that this product be used with an exfoliating file. The foot peel mask contains a high concentration of AHAs that may cause skin irritation. To ensure skin compatibility, it is advisable to test a small area of your foot before use. Use booties immediately after opening to prevent the essence from drying out. I've had no peeling of any skin whatsoever and it's not the result that I was expecting. I'm not sure why nothing has happened, but it's a huge disappointment. Maybe my feet are too well cared for and perhaps the product only has the desired affect if used on very neglected feet. 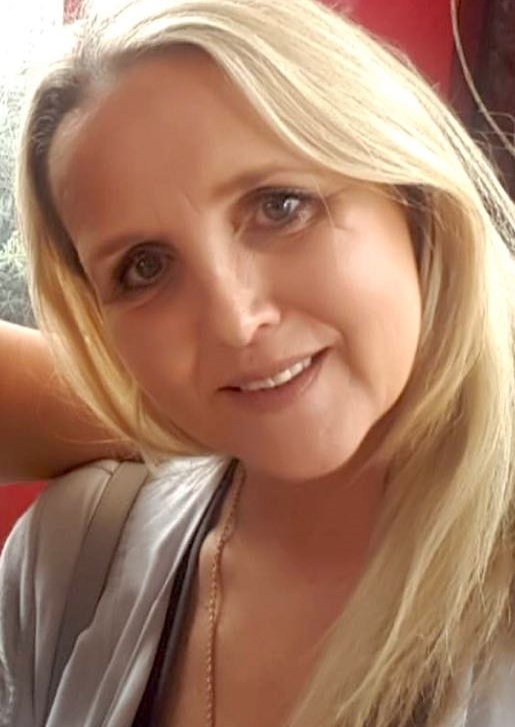 My eye area has always been a cause for concern, as I'm sure it is for most women regardless of age and as they say "the eyes are the windows to you're soul" and I for one don't want to have my windows surrounded by dull, dry, lined or fatigued skin. This eye mask sounded like the perfect quick fix, as it promises to plump those telltale fine, dry lines and make your eyes look instantly more radiant, rested and renewed. What’s more,the eye mask is seriously infused with Advanced Night Repair technology and delivers 20 times more of the proven soothing, hydrating and repair ingredients compared to one application of the Advanced Night Repair Eye Gel Cream. Apply on clean skin, once a week at night. Press liquid chamber to break seal and release formula onto the fabric pads. Then massage gently to ensure pads are fully saturated, as there is a lot of serum to be absorbed. Tear open the packet and separate the pads (discarding the clear divider), then apply one under each eye.The heavily saturated pads are quite large and covered a decent area of skin, both below the eye and up around to the temple area. 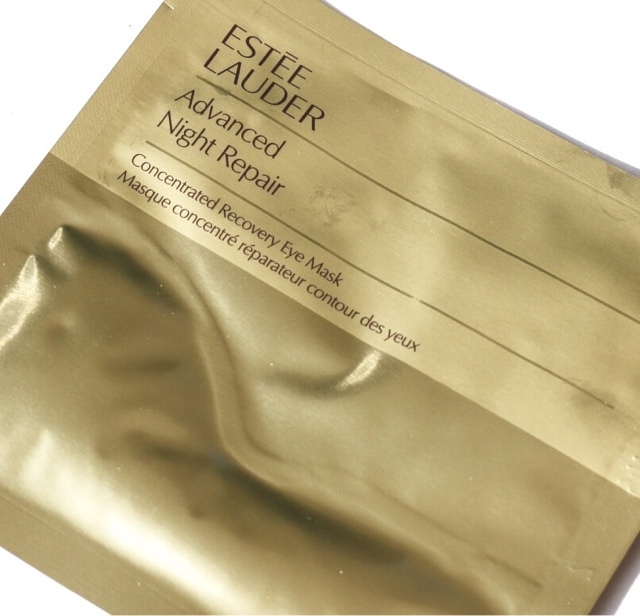 Estée Lauder suggest to leave on for 10 minutes, but I left on for a good 15 minutes or so and even after you remove, the now much drier pads, you will still need to gently pat in any remaining serum. If desired, follow with your favourite eye cream, but I didn't feel this was necessary. For an extra burst of refreshment, I highly recommend you chill a packet in the refrigerator before you apply. Despite my initial difficulties with the packaging I absolutely loved, both using the eye mask and the results it gave. Instantly, my eye area felt cool and refreshed and I couldn't believe that in just 10 minutes my eyes look more rested and the dry lines were plumped and the skin around my eye area felt drenched with hydration. However what impressed the most about the mask, was how my dark circles had been minimised and more importantly the skin had a more radiant appearance. This eye mask would make a powerful addition to your Advanced Night Repair beauty regime if you are already a loyal fan, but would assimilate perfectly into any face care routine. Without hesitation I would recommend this "hydration lifesaver" for use on a tiring and dehydrating long haul flight and the sachet is so easy to pop into your cabin bag. This eye mask is also a "must" use product prior to a special occasion. Just to give you a "heads up" this product will, without a doubt be on my top 5 Skin Care Product list for 2017! Honestly what more could you ask for from an Eye Mask? I was quite excited to recently receive a book in the post to review, now normally I wouldn't do book reviews, as it really isn't my niche unless it's beauty related, but this particular book piqued my interest. 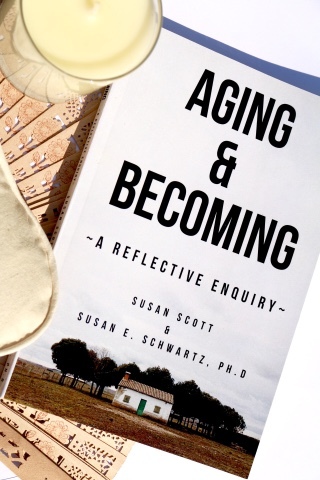 South African author and student of Jung, Susan Scott, has teamed up with her US counterpart Susan Schwartz to write Aging and Becoming: A Reflective Enquiry, an inspirational book which is receiving rave reviews on both US and UK Amazon sites. The book is comprised of correspondence between the two authors, which began with each writing back and forth on the letters of the alphabet oriented on the subject of aging. The two Susans challenge the view that the older woman has little to offer. Rather, aging is an opportunity to express a more rounded out personality as the tug towards becoming authentic becomes more persistent and real. Just as many reflections occur allowing for growth and new ventures to happen. Each writer feels the shifts on emotional, psychological, mental and physical levels.